This darling toadstool fairy cake design is truly unique so I had to share it! 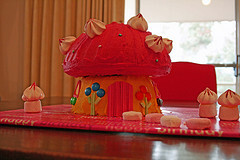 Another cake option for a fairy party is to add some fairy figurines to the top of a cake. And what do fairies love? Flowers, and all things of nature. So as another option, a flower or daisy cake would be loved by all your little fairy guests! Site visitor Olivia from Australia shared a recipe for Fairy Bread. She says "this is a great party treat for all ages"